At this point of time, there is probably no one who does not know who Cristiano Ronaldo is. The 33-year old is the world's best football player, a professional athlete from Portugal, currently playing for Real Madrid. Considered the greatest football player of all time by many, Ronaldo is a record 5-time winner of the Ballon d'Or, having won it in 2008, 2013, 2014, 2016 and 2017. But these awards are not his only accolades – the Portuguese player is also a 4-time winner of the renown European Golden Shoe award, having claimed the award in 2007-08, 2010-11, 2013-14, and 2014-15. Clearly, Ronaldo is great on the pitch, but football is not the only game he is good at. In fact, the world's greatest football star is a very skilled poker player as well. Coincidentally, Ronaldo is even a representative of the world's biggest site for poker games – PokerStars. The poker site and the football superstar have been working together for more than three years. During that time, Cristiano has been indulging in various charity games organised by PokerStars, as well as advertising some of the most popular games available at PokerStars. Cristiano Ronaldo "Spin & Go"
Spin & Go tournaments were created in the dawn of 2016, with Cristiano Ronaldo as a brand ambassador. This type of tournaments begins as soon as three players register to play. And no sooner do three players register to play than the tournament prize is revealed. Tournament prizes, by the way, are unique. 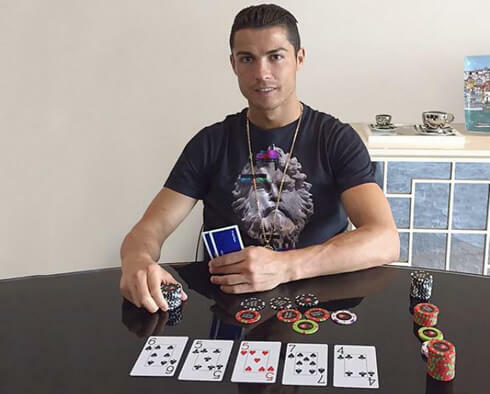 Players can win Cristiano Ronaldo items by playing Spin & Go poker at Bonus Insider, and catch a glimpse of his unique lifestyle. Spin & Go tournament prizes include All-in Shootout ticket, ROC by Monster – Sport Black Platinum headphones, Cristiano Ronaldo DVDs, and even a supercar worth more than $440,000. Play PokerStars Spin & Go tourneys and you have the chance to win a McLaren 650S, a Ferrari California T, an Aston Vanquish, or a Lamborghini Huracan. But that is not all – if you commit just $0.50 to playing Cristiano Ronaldo Edition Spin & Go, you have the chance to win up to $1 million in cash. Getting started is as easy as a child's game – you can play Spin & Go tournaments on your mobile. One of PokerStars's most successful campaigns, which surpassed 158 million views and had a couple of installments featuring Cristiano Ronaldo and the well-known basketball player Dwayne Wade. The superstars were part of the second installment of the campaign. #raiseit was a PokerStars campaign, which lasted for three months – from November 2016 to January 2017. The ultra successful campaign ended with Cristiano Ronaldo and Dwayne Wade boasting incredible skill while operating a drone. 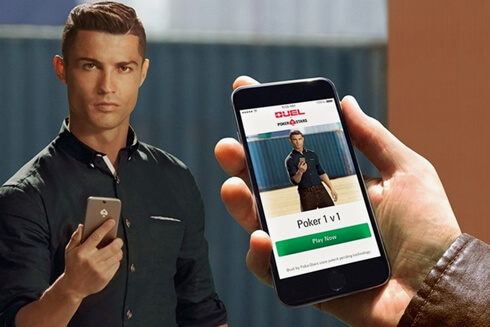 The amusing social campaign launched by PokerStars ended with Ronaldo and Wade battling their drones in the "Aeriel Duel" round. Videos of the event, as well as the whole campaign, are available on social media sites. In a statement, Cristiano said that #raiseit is more than a social campaign. According to the professional football player, #raiseit was about encouraging people to show their talents. Be it a trivial thing someone does on a daily basis, the superstar commented, or a secret talent used to surprise people, talents are vital and should be showcased. Back in 2016, PokerStars produced Web Series with six superstar celebrities. The celebrities had to play in a series of one-on-one duels for charity; the games were filmed and posted on social media. 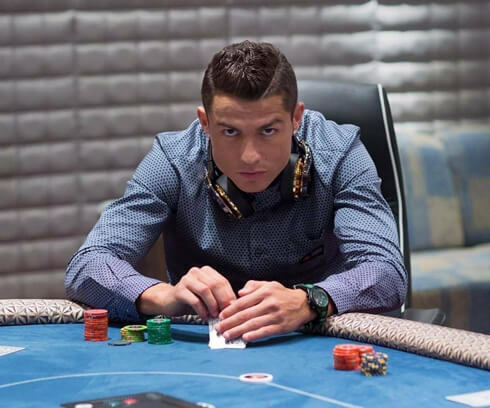 The celebrities who participated in the PokerStars series were Neymar Jr, Aaron Paul, Mirieia Lalaguna Royo, John Boyega, Sara Sampaio and Cristiano Ronaldo. Apart from celebrities, a number of professionals from the PokerStars Team acted as poker coaches, advising the celebrities and assisting them during the matches. Each celebrity paid $5,000 to participate and all winnings were donated to whichever charity each celebrity desired, such as "Right To Play", as well as "Save the Children". In the PokerStars Web Series, Cristiano Ronaldo played against Breaking Bad superstar Aaron Paul. Needless to say, Aaron was completely defeated and the Real Madrid superstar won $20,000. Video of the one-on-one duel is available on the web. Cristiano Ronaldo defeated Aaron Paul with two Jacks and donated the $20,000 he won to charity, to the Save the Children organization. Aaron was fooled into going all-in by the football superstar. But when Cristiano revealed his trump cards, the actor knew he had lost. All in all, Cristiano Ronaldo is a living proof that man can have many talents. As you know, Cristiano is known all over the world for his unparalleled skills on the football pitch. But few know that he is also an incredibly good poker player. 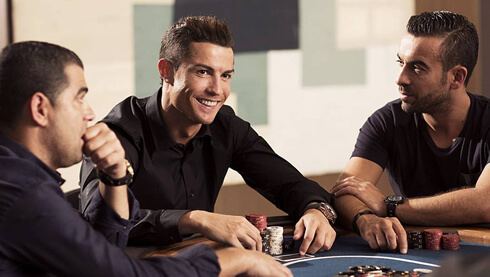 Cristiano's love for poker made him a superstar outside the football pitch. 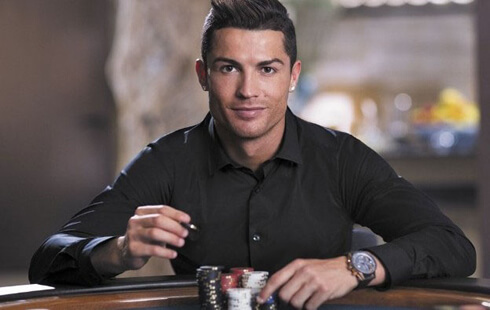 Additionally, his partnership with PokerStars is a living proof that anything Cristiano does turns out great. Cristiano Ronaldo next game for Real Madrid is on July 31 of 2018 against Manchester United. You can watch Juventus live stream, Manchester United vs Real Madrid, Tranmere Rovers vs Liverpool, Croatia vs England, France vs Belgium, and Bayern Munich vs PSG, all matches provided from our soccer live game pages.